This is the routine we follow at Mucky Pups but we are very flexible with it and always respond to the needs of the children in that day. For that reason our routine is entirely flexible and can be adjusted as needed. 8.30-9.00: Children self register, putting their picture on the ‘who is here today’ board. 9.15: Registration. We discuss the weather, day of the week and talk about the exciting things we are going to do throughout the morning. 9.30: Snack time. This is a sociable time at Mucky Pups, the staff sit with the children and we talk about the healthy choices we have today. 9.45 - 11.20: Free choice time both inside and out. During this time there will be activities happening that the children can chose to join in. 11.20 - 11.45: Tidy up time, circle time and get ready for lunch. 11.45 - 12.45: Lunch time. Adults and children sit together. 12.45 - 1.15: Morning children get ready to go home and afternoon children arrive at 1PM. 1.15: Registration. We discuss the weather, day of the week and talk about the exciting things we are going to do throughout the afternoon. 1.30 - 3.15: Free Choice time both inside and out. During this time there will be activities happening that the children can chose to join in. 3.15 - 3.30: Circle time. 3.30: Snack time. This is a sociable time at Mucky Pups, the staff sit with the children and we talk about the healthy choices we have today. 3.45 - 5.00: Free choice time both inside and out. During this time there will be activities happening that the children can chose to join in. 5.00-5.30: Tidy up time. Story/quiet time and get ready to go home. Key workers are your immediate point of contact when your child starts the setting. Each member of staff has a designated group of key children whom they focus on. Your child will be designated a key worker usually on their first day but sometimes it can take a little longer to decide who your child is going to relate to the best. We try not to change keyworkers once they have been established but on occasion this may be needed, for example due to a staff members long term absence from the setting or a child not forming a close bond with the staff member. We will notify you of any changes we make. Your key worker will be responsible for filling in your child's home to preschool book each week (see below for details) and will aim to talk to you face to face at least twice per week. Collection times are often very busy and it may not always be possible for staff to talk to you each day in a lengthy discussion. If we have important news to pass on to you we will do so that same day. We encourage the children to be fully invovled in all aspects of preschool life including cleaning and tidying up etc. The staff aim to teach the children not only how to stay healthy and clean but also why! The children know how to tidy their own cups and plates away at dinner times as well as when to wash their hands. We aim to serve healthy snacks and drinks at snack time and have just signed on to the 'HEALTHY HEROES' scheme which works with children and their familes to improve knowledge about all aspects of keeping healthy in daily life... from sleeping to eating to food choices. Hand washing (left and right) is an important part of our daily routine. 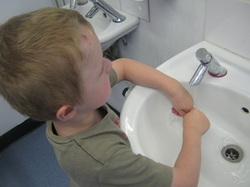 The children know how to use the soap, and wash their hands in their own special sink in the toilets as the sink in the main romm is used for washing cups and plates after snack and lunch times.